Ayurveda has answers to all our health problems. This science of natural healing has given us more health than one can imagine. Yet we utilise it so less, the health benefits through Ayurveda are immense but lack of awareness around Ayurveda and approaching Ayurveda as a cure is not a priority for many. So why so less people adopt Ayurveda ? well people feel Ayurveda works, But it complicated and old-fashioned. It’s not for people like us. Probably Kiva is determined to change that through there products. 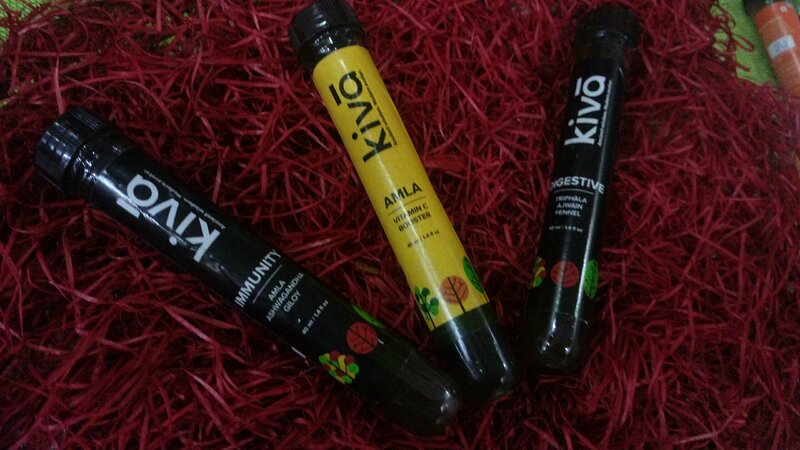 So here I came across this wonderful product that puts goddess of Ayurveda back in a test tube and making the goodness sealed in these smaller packs to consume on daily basis. So what I got was these variants of Kiva as it says ancient wisdom in modern avatar. 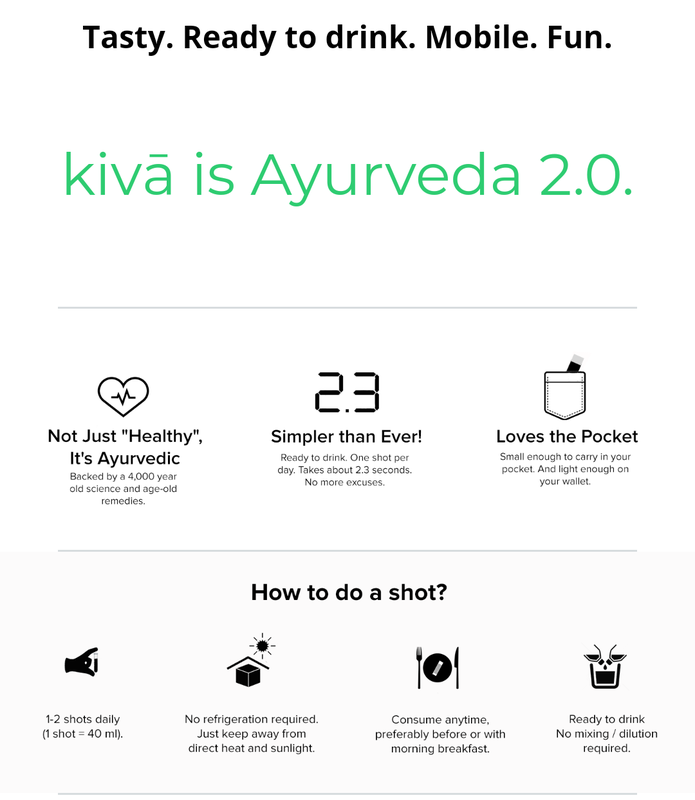 Kiva Aloe Vera : Thanks to Baba Randev and his efforts around Ayurveda and natural living, aloe Vera has become a house hold thing. My mom planted these aloe Vera plant in our terrace garden and ever since the plant has multiplied into 10 other pots. So while I opened to taste these shots to taste, this one tasted more palatable then the one that mom was making from the fresh aloe Vera. And off course this is hassle free too. 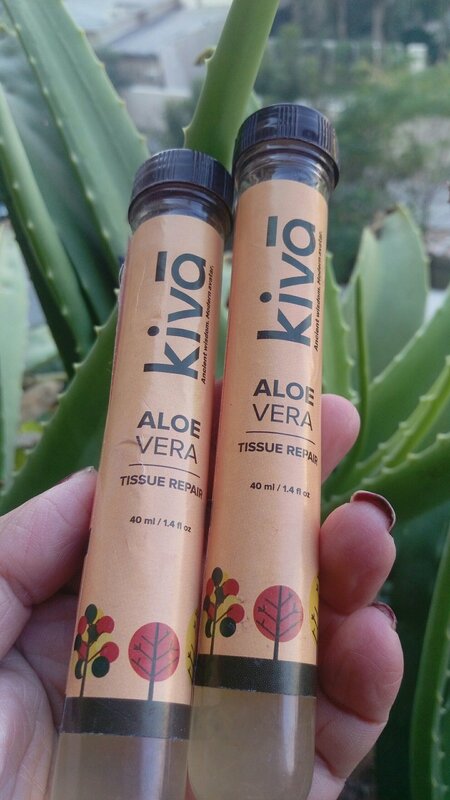 Kiva Aloe Vera is good for Tissue repair and we can’t deny that this will definitely help in slowing the aging process. 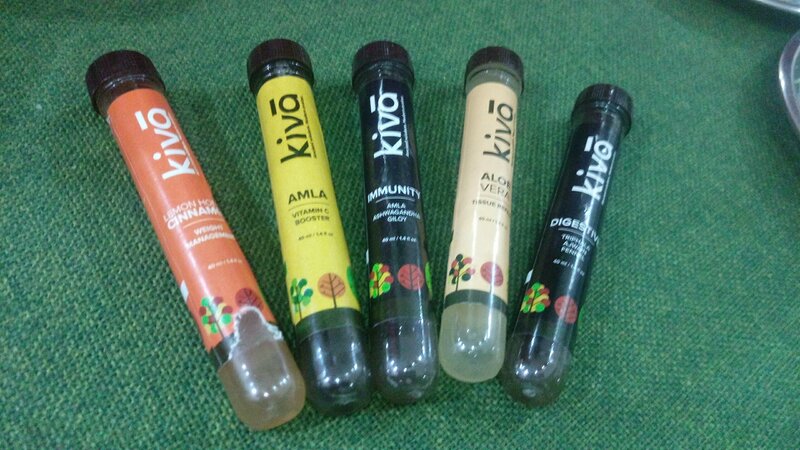 Kiva Amla : After aloe Vera the most sort after herb and is readily available is Amla. Though it’s seasonal but there are enough and more ways to consume this Vitamin C natural boosted through out the year to keep on with the powerhouse of Vitamin C with Amla. And this is also available through out the year in these dosage of 2 a day. 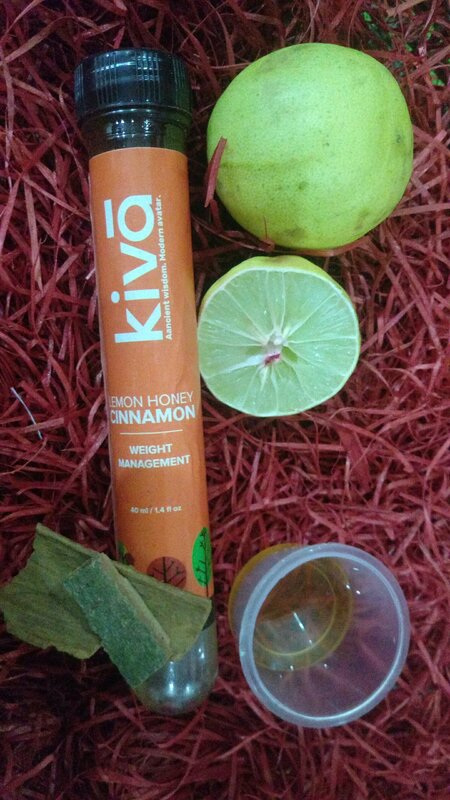 Kiva Lemon Honey & Cinnamon : This one appealed the most to me as it was most apt for my health state and off course when something reads weight management then eyes off course go rolling. So this one had the goodness of honey lemon and cinnamon which is a great combination to loose weight if had empty stomach. 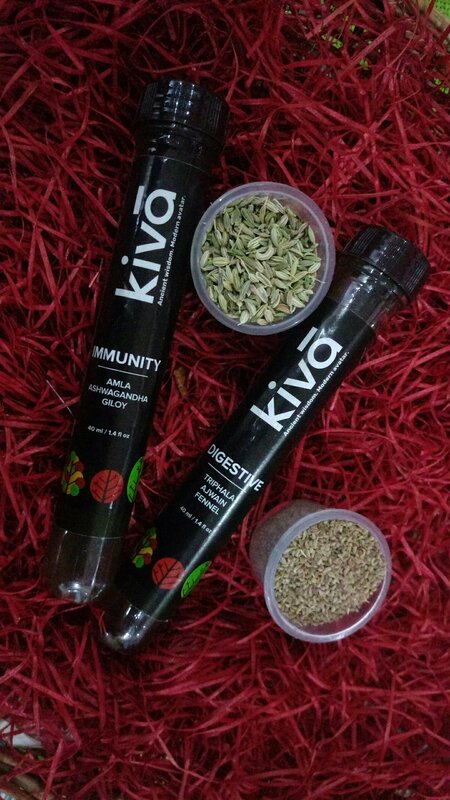 Kiva Digestive & Immunity : The two simillar looking shots had different health benefits one boosted immunity while the other was for good digestion. These are not advised for kids under 12 years or for women who are pregnant. In case of anyone who is under medication needs to consult the doctor before starting. A shot starts @ Rs. 20 onwards and the label advices 2 in a Day. The shots are good to consume within 120 days of manufacturing and doesn’t need any refrigeration. So all you need to do is just order your health pack and have it everyday. It’s definitely better than the money spend on cokes and soda or any soft drinks for that matter. I personally feel these products are just apt for the lazy bones like me, you may find your reason to take it. EditTake your first step to a healthy life by including little bit Ayurvedic remedies and products.